The Fermi space telescope was launched in 2008 and since then achieved remarkable results in the investigation of gamma ray source. This is a NASA mission but includes the collaboration of the Department of Energy and contributions of institutions of various nations. 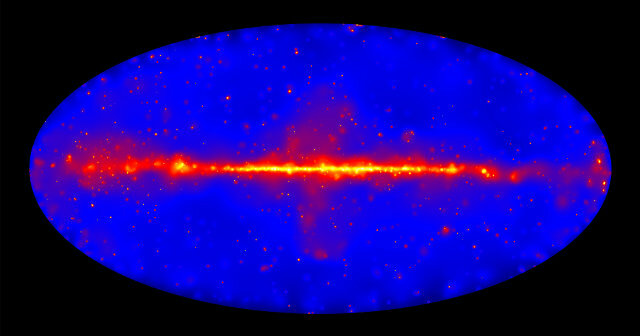 During the Fermi mission there were many successes but scientists also noticed its flaws. In particular, the problem with LAT was that it couldn’t identify events at the lowest highest energies. This was not due to an instruments flaw but to a limitation of the software that reconstructs data from the traces left by the electron-positron pairs generated by the interaction of a gamma ray with the matter of the LAT’s detector. To eliminate this problem it was necessary to write a brand new software, a really complex task despite the experience accumulated over the years by the Fermi mission’s scientists. For this reason, it took about four years to complete the new software but the results were what they expected. The consequence is that now Fermi is a better instrument capable of detecting certain events which previously could be noticed only by ground-based detectors. With this new software, it was possible to compile a new catalog of gamma sources at energies between 50 GeV and 2 TeV. It includes 360 sources of which 75% is composed of blazars, distant galaxies with jets powered by supermassive black holes, 11% related to particles accelerated by pulsars or by supernova remnants and the remaining 14% has an origin yet to be established. Only 90 of these sources were identified by ground-based telescopes. A paper describing the new catalog was accepted for publication in “The Astrophysical Journal Supplement”. Especially the sources observed only by the Fermi space telescope will be the subject of further studies. These results demonstrate that the experience gained in the use of an instrument already extraordinary can further improve it to help even more scientists to increase our knowledge of the universe.